Hey y'all! :) I'm not generally a 'VOTE for me!!' kinda contest person. 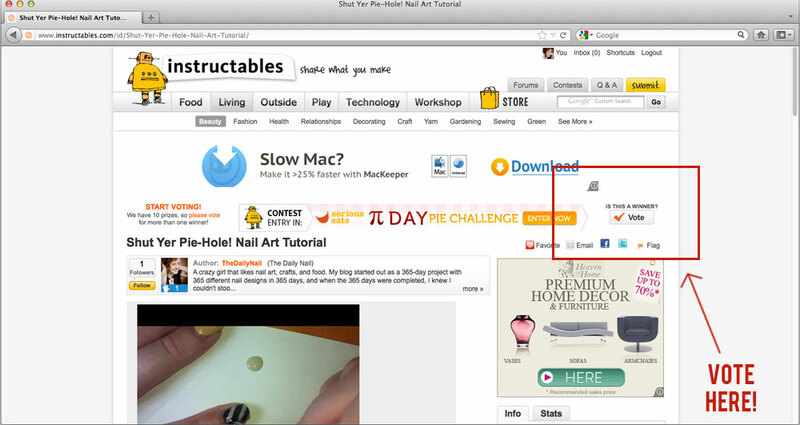 In fact, this is my first contest I'm entering for nail art tutorials, or actually, I think nail art in general. Well, here's the thing... Instructables.com (a super awesome website that is full of useful tutorials of ALL kinds) is having a contest to celebrate Pi Day. The only rule? The tutorial MUST involve pie. (They never said anything about edible! ;)) I decided to do a tutorial for my Shut Yer Pie-Hole nails and try my luck. Anyway, this is where you come in... there are just under THREE days to vote on my tutorial! you had to login/signup to vote. no problem to login through facebook and do it though, you got my vote, girl. good luck! Thanks so much!! :) I appreciate it! voted : ) Good luck! You should think about adding LcB Nail Lacquer to your collection, it'd much easier if it was on Walmart shelves!